The cast, led by Father Piotr Nawrot, will release two repertoires in the cities of Miami, Washington and New York. 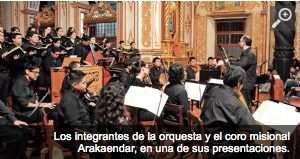 The orchestra and chorus of Bolivia’s baroque music missionary, Arakaendar is the first to take this music to audiences in the United States. “I do not know how many Bolivian artists gave concerts at The Kennedy Center in Washigton DC, which is one of the most prestigious concert halls in the world”, celebrated Father Piotr Nawrot, artistic director of the orchestra and choir. The concert tour of the cast, which was founded in 2005, will begin tomorrow [02/27/2015] in the temple Corpus Christi in Miami. Then, will be presented on March, 3rd and 4th in Washington DC, and March 5 in New York. “The presentations correspond to an invitation Nawrot received while in Colombia, after attending a meeting with organizers of festivals around the world,” reads the press release. Nawrot said that there are two programs that form part of this tour: one will be missionary music (from the archives of Chiquitos and Moxos) and the other is the show called Baroque in Indian languages, with music from Mexico, Guarani, Chiquitos, Moxos and Quechua. The cast is composed of 22 musicians of the choir and Arakaendar orchestra, who will head for that country. To that number, four guests from the Royal Col music school will join.